Make any seat the best seat: Learn how to embrace the latest equipment and systems to enhance your fan experience inside the venue as well as the production technologies to engage fans watching elsewhere. The venue’s capacity now is just a small part of your capacity to build, deliver and profit from live events. From audio, display, lighting and effects, an exceptional experience for every seat in the house at any live event is crucial. As of today we feature 20 companies and their approach at the NAB2018 Show. This list is continously updated. 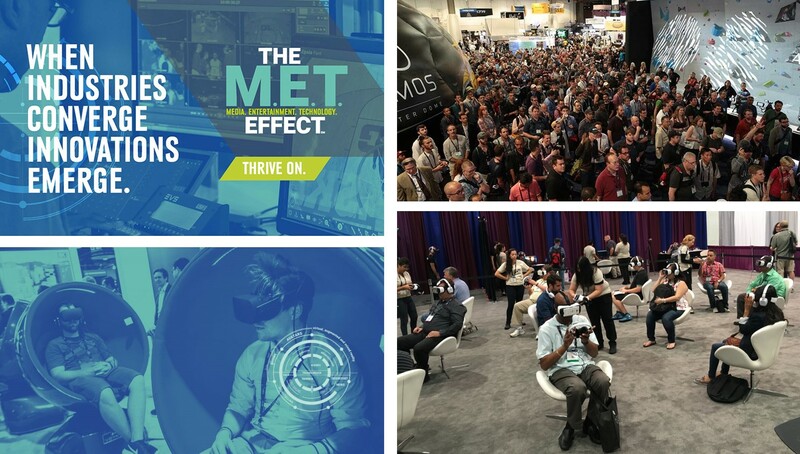 NAB2018 opens in one month on 07 April at the Las Vegas Convention Center. Tri-Lite TV now offers a choice of 3 HD mobile production units. Featuring state of the art technology, all backed by a team of experienced engineers. We regularly travel throughout Canada and the US covering a wide range of events. Our mobiles are maintained in top form to ensure an enjoyable and stress-free experience. Introducing Alto, our 53′ fully equipped expando mobile – capable of 14 cameras, 4 EVS systems and features a Sony 104 input 4 M/E switcher and Calrec Alpha 72 fader audio console. Cirrus is our 8 camera expando mobile typically used for sporting events and entertainment shows. Stratus is a cost-effective 6 camera mobile ideally suited for series work, teleconferencing and corporate events. Flycom was established in year 2005 and operates under Russian Ministry of Communications license. Flycom company operates in compliance with ISO 9001 2000 and provides following services: uplink, downlink and turnaround services for television, radio and data channels; operation and integration of mobile and stationary uplink and downlink satellite systems. Flycom is one of the leading providers of mobile satellite transmission services. Our company possesses diversified experience in worldwide television broadcasting. Our OB van, Drive-Away, Fly-Away systems have been broadcast a major events in Russia and CIS such as breaking news, conventions, sport events and entertainment. Our mobile systems can professionally satisfy your operational and broadcasting needs. After the successful debut of OB2 and OB11 in 2017, delivering landmark 4K events such as the Isle of Wight festival – a European-first in entertainment broadcasting – and international test cricket for Sky, the refit project is now complete on OB4 and the trio is busy on the road providing HD and Ultra-HD production capabilities for contracted and ad-hoc assignments. CTV works closely with Axon and has relied on Synapse signal processing across its fleet for a number of years - a choice based on its proven reliability, scalability and design that is 4K-capable as a matter of course. CTV supports a wide variety of live sports and entertainment events and such productions demand efficient, flexible and adaptable workflows that can be easily operated by both staff and freelancers alike. "Chyron, and now ChyronHego, has been our valued partner for broadcast graphics for more than 25 years, and we've come to trust the reliability and maturity of their products. Knowing we can count on ChyronHego systems to operate seamlessly in our often harsh mobile environments is of tremendous value," said Mike Johnson, director of engineering, Dome Productions. "Upgrading our entire fleet of production trucks to the latest generation of ChyronHego's LyricX-based character generators is a big step forward operationally, and it's also a direct response to client requests. A common character-generation format across our entire fleet will give us a boost in both speed and capability and help accelerate productions of all sizes." The Lennon Bus is the premier, non–profit mobile pro–audio, video and photo production studio, providing hands–on experiences for thousands of visitors annually with assemblies, workshops, and production demonstrations. Working with educators and musicians, the Lennon Bus gives young people an environment in which to write and perform music, engineer recording sessions and produce videos, using the latest audio, video and production equipment. OWC and the Lennon Bus will collaborate at the SXSW Festival in Austin in March. Activities and performances will be presented for festival attendees, with a short film produced afterwards by Lennon Bus students that will commemorate the events. With real-life storytelling Eurosport is delivering the ultimate Olympic Games viewing experience, enabling audiences to enjoy every minute of live action from PyeongChang 2018, whenever and on whatever device they choose to watch it. From South Korea to Germany, Sweden, to Norway and Finland and to the United Kingdom, a total of 17 studios across the world are playing host to Eurosport’s cast of 150 winter sports experts and adding the local view on the events in PyeongChang. More than 85 racks of equipment were installed in the International Broadcast Centre (IBC) in PyeongChang. All the equipment is provided by NEP. All of the venue equipment has arrived in pre-staged flight-cases and was up and running as expected. Eurosport is broadcasting the Olympics in 42 languages, this itself makes the whole project incredibly. Pitbull’s Las Vegas residency has been running for the last couple of years, usually in blocks of three or four weeks at a time, three or four months apart, and it’s a “90-minute non-stop party with each song starting big and getting BIGGER,” described Tom Sutherland, the lighting and visuals designer. The 4,600 capacity Axis Theatre has a massive curved house video wall at the back which is included in the technical package, so Tom’s design was evolved around that, which as it happens, really suits the style of their show. It gave “Pit and the dancers a bit of a playground,” explained Tom. The beautifully designed, record breaking, box-office busting tour kicked off in Stockholm in May 2017 and is currently scheduled to continue until the third quarter of 2018. It sees the band - and the genre-defying incendiary live performances keeping them at the bleeding edge of ‘cool’ for four decades - enjoying more global adulation, success and critical acclaim than ever! Blackburn UK based HSL is extremely proud to be the worldwide lighting vendor for ”Global Spirit” which plays a mix of stadiums and arenas embracing every continent … working with a highly talented team on the road headed by production manager Tony Gittins. As Canada's largest arts training institution, Banff Centre is situated on a stunning 42-acre campus in the Canadian Rockies near Banff, Alberta. Prior to acquiring the MediorNet system, the Banff Centre staff was spending an inordinate amount of time every day transporting and setting up equipment at different venues in order to establish remote operations for capturing and transporting camera signals. Now, with a MediorNet Compact PRO unit deployed permanently in each of two control rooms and three more used as portable stageboxes at various event venues, Banff Centre can simultaneously interconnect multiple performance and recording spaces with a self-healing, redundant feed of multiplexed HD-SDI video, MADI audio, analog audio, Ethernet, and intercom signals.